According to Nielsen Global Survey of Automotive Demand, almost every Malaysian owns a car, the third highest rate of car ownership in the world. 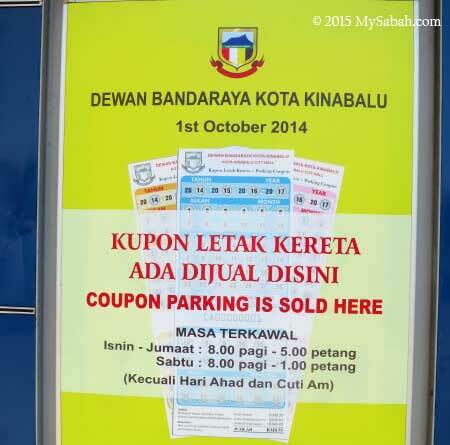 Kota Kinabalu City (KK) has a population of over 600,000, imagine what it is like when half a million cars compete for 10,314 public parking lots (exclude private parking spaces) in and around KK every day. 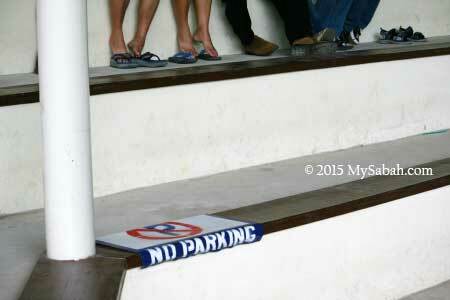 Pic: No Parking, No Parking, No Parking… We mean it! Inevitably parking has become a daily battle with local authority, ill-mannered motorists and even criminals. 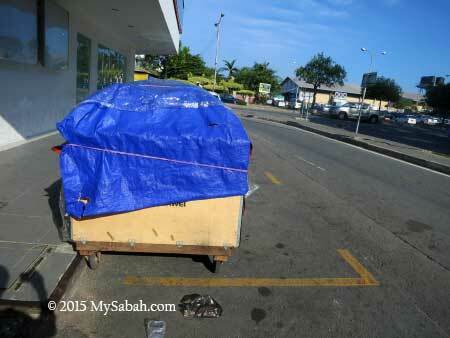 For my case, going to KK takes me only 20 minutes but finding a parking can take more than half an hour sometimes. Yea city life is tough. 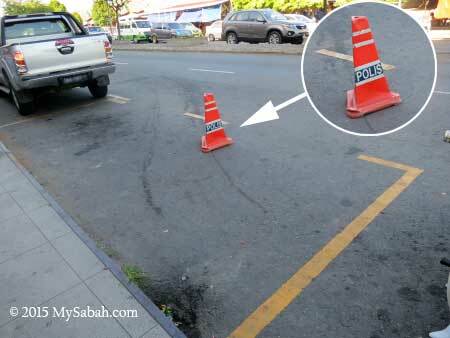 In this article are just some trivia and interesting photos of parking in Sabah. 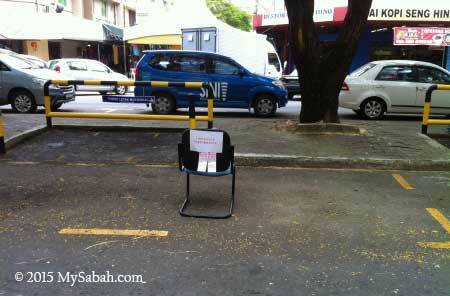 Some people would attempt any mean to reserve a parking lot, for example, placing an object to “book” the spot. 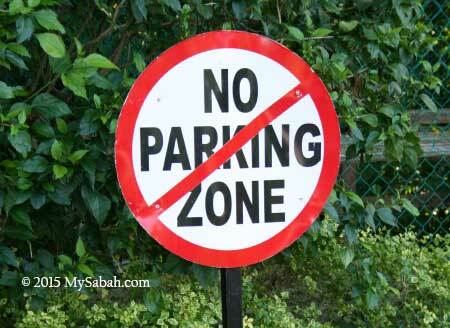 Public parking lot is provided on 1st-come-1st-serve basis, so it’s illegal to block others from using it. 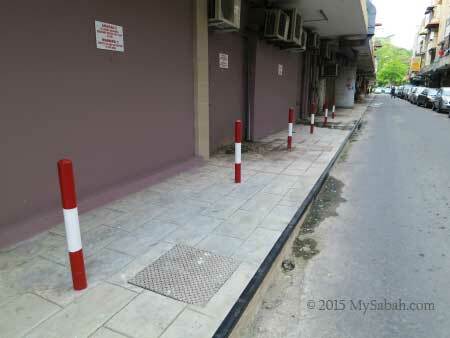 For shop / individual that needs this public space for their business (e.g. 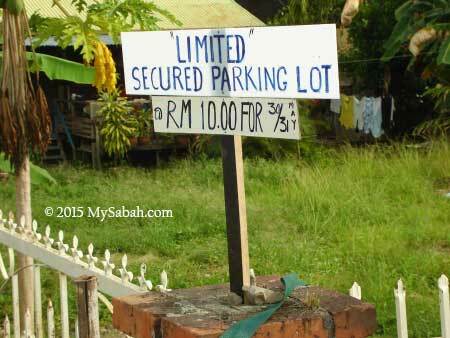 car washing, cafe), they must rent the space from DBKK (and the monthly fee isn’t cheap). Decade ago, after you parked your car, a street kid would approach you asking for “protection fee”, or a foreigner carried a bucket of water offering lousy car cleaning service. If you refused to give what they wanted, you would find scratches on your car later. Luckily, it’s no longer happening in KK. 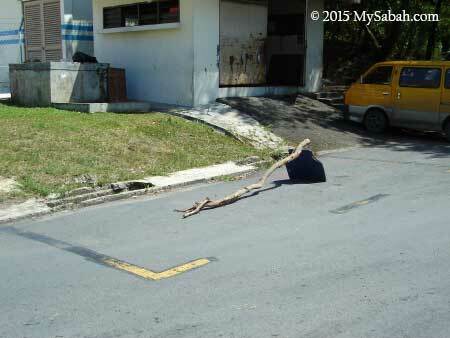 Be careful in your reverse parking. There are always some idiots who are oblivious of the reverse signal and walk pass your rear while your car is moving. It’s a miracle that such morons can live more than 20 years old. I hope they won’t breed. You can easily tell if a person is a loser by looking at the way s/he walks and cross the street. Stay away from them because they always blame others. Out of the blue a car alarm could set off for no reason, its 200-decibel siren can go on for hour and the owner is missing in action. The repeating high-pitch noise is a mental torture to everyone living or working nearby. They better stop using those hypersensitive alarm that is program to prevent mosquito from stealing their car, or nobody will bother to check, when the real car thief breaks in next time. While leaving, if I notice any car waiting for my parking spot, I’ll start my car and leave as soon as I can. But not everyone does the same. It is truly frustrating when someone dilly-dally (taking time to check their phone and touch up their lipstick, etc) before starting the engine and leave, though they can see you waiting. Pic: Thinking outside the box is good. Parking outside the box is #fail #parking. 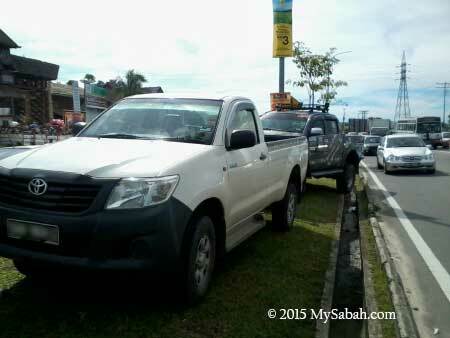 In fact, traffic police can compound this car RM70 for improper parking. I don’t mean to be sexist, but in my experience it’s always women. People will see you as a beautiful person if you are considerate and thoughtful, so you can save your make-up for later then. 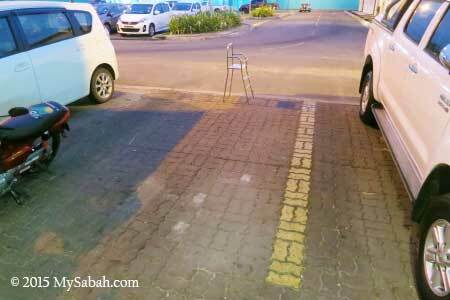 I can hear the loud YES in your mind, but still, you will be astonished by the terrible parking skill of Sabah drivers in Kopi-O Lesen Facebook. Do these selfish motorists think their fathers own the road? 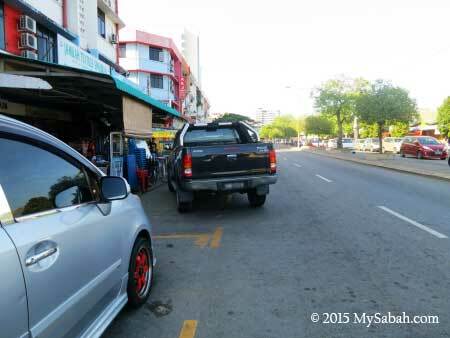 Double Parking happens everyday, everywhere in KK because of lack of enforcement. 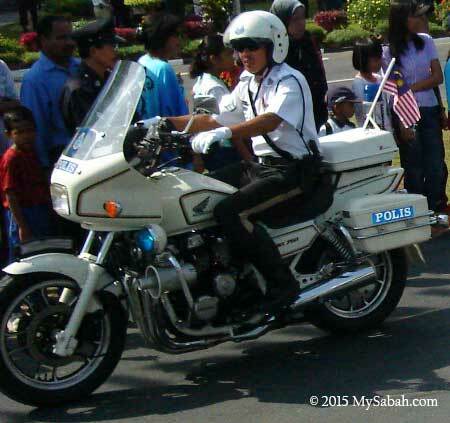 Since our Uncle Police is always busy escorting VIP convoy, I’ll be more than happy to lend a hand. If they give me the right to issue summons to these cockroach motorists, I’ll do it for FREE. 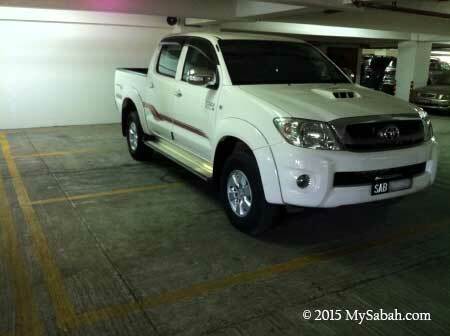 Double parking is simply an act of selfish and laziness. If we are willing to park further away, we never need to double park. Come on lah, if you must double park, at least leave a phone number on your dashboard, so the “victim” can call you to move your car away. 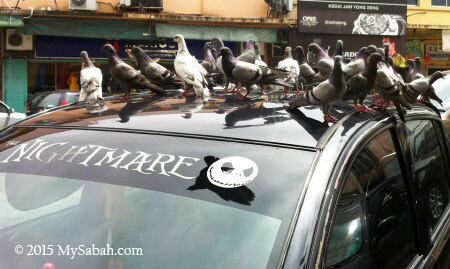 It’s so irritating to honk a long time but the owner is nowhere to be seen. I would be lucky if the car didn’t have its handbrake on, so I could push it aside. I know this is wrong, but sorry I have no compassion to what happened to that car. This is a good message to those suckers who like to double park. I did ask Uncle Police how to deal with double parking. One of them says we can call 088-310273 (traffic police in KK) and a traffic police will issue a RM100 summon to the motorist who blocks your car. 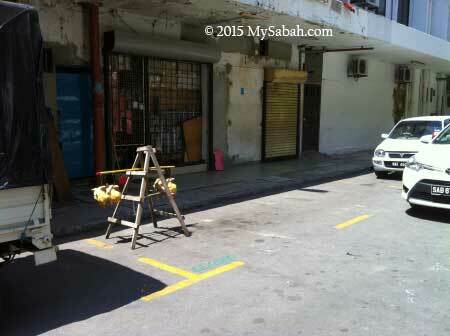 Unfortunately, we can’t request them to tow away the stupid car, unless it obstructs the road. Isn’t it a common sense not to leave anything in our car to prevent break-in? There have been news like burglar stole a quarter million of cash left in the vehicle. As there are so many fools in KK, I did seriously consider thievery a better career. In another case, a car of my female friend broke down. A group of “friendly” people came to help. 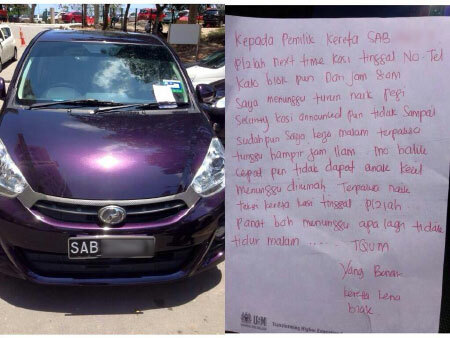 She was so happy and thought she was hot, then she found that her wallet and handphone on the dashboard went missing. 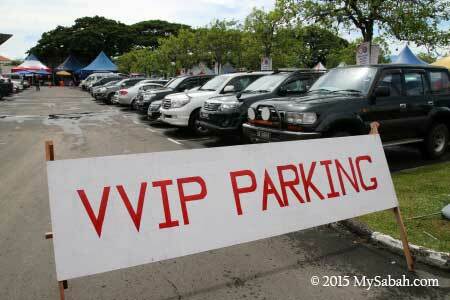 Pic: reserved parking lot with tickets, look fair. I also heard many cases that people left their car unlocked for only a few minutes then their car was hijacked. Losing money or your car is bad enough, but the worst thing is when your car disappears with your child. I guess you still remember the shocking news of You-You, a 3-year-old boy who was abducted in the car left by his father at a petrol station in Kampung Air last year. The car was found but the boy vanished until today. Negligent parents can be sued under Child Act if they leave their kid in the car. 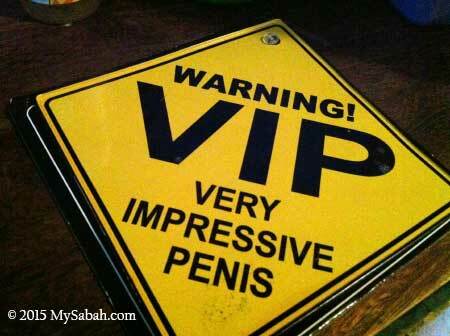 Just for a few minutes of convenience, you would regret for life. Sadly, history teaches us that similar tragedy will happen again. 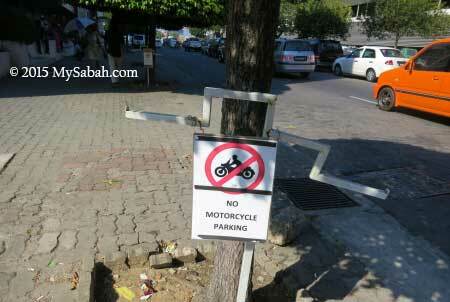 Park at your Own Risk? Some private car parks put up a “Park at your Own Risk” exemption clause at their entrance or have it printed on parking ticket. Based on Consumer Protection Act 1999, if car park operators charge you for using their parking space, they are liable to any damages to vehicles parked in their premises. 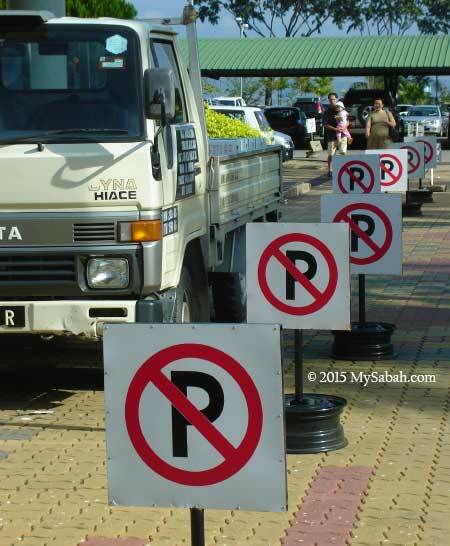 For many years consumers had been fooled by car operators this way, until 24 Apr 2009, a magistrates court in Penang ordered a car park operator to pay a lawyer RM1,668 for items stolen from his car parked at an open air car park near Komtar. Knowledge is Power indeed. If your car park operator refuses to take responsibility for any damages to your vehicles while parked in their premises, you can complain to Ministry of Domestic Trade, Cooperatives and Consumerism (MDTCC). You should also lodge a police report for your loses, and document the incident (e.g. 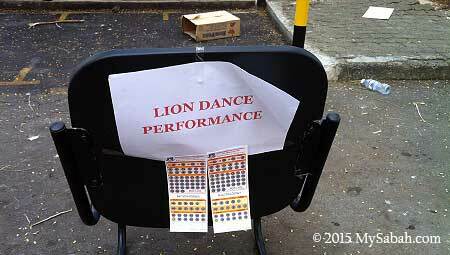 photos, parking ticket). Pic: I sincerely hope this is not your car. It’s really a nightmare. Stop feeding pigeons, they are city rats with wings. However, you should avoid making your car a promising target, leave nothing in your car. Probably the car park operator would compensate for your stolen items and broken window, but you won’t get any profit either, it’s troubling both sides only. Car park is a dangerous place for ladies. I know one shopping mall in KK has malfunction CCTVs, they never fix it and they always fail to prevent the repeating crimes. Their security guards are also no useful than scarecrow. Abduction has been happening in car parks of Peninsular Malaysia and the victims were robbed, raped or murdered (or all of the above). 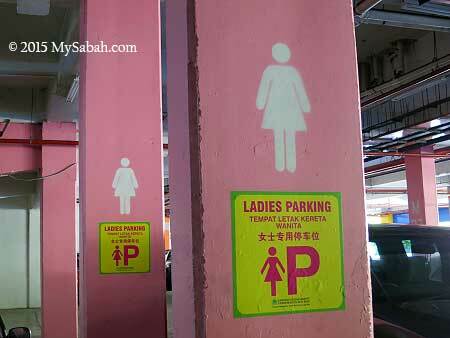 Some car park operators have demarcated a “Lady Only” parking zone for female drivers. Anyway, you should take charge of your security. Be vigilant and don’t let your guard down. Once you get on your car, lock the doors immediately. If we don’t care about our safety, no others would. 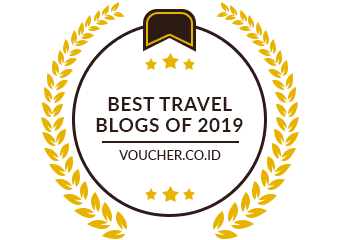 At first I didn’t like the idea of “scratch and park” prepaid ticket. 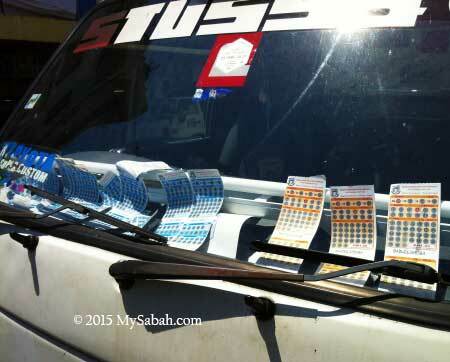 In fact, this DIY approach eliminates my need to keep track of all unpaid parking tickets (tedious!). It works better for me this way. 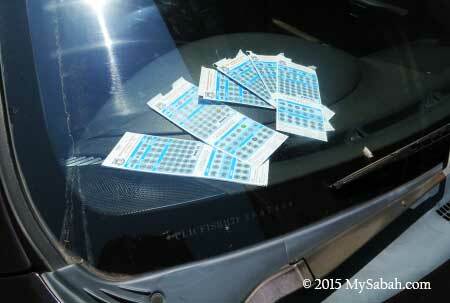 Pic: I hope there is a better way to display the parking coupons, it looks so untidy on the dashboard. My only complaints are – the system uses too many paper, and sometimes it’s hard to estimate how long I would park at a place. 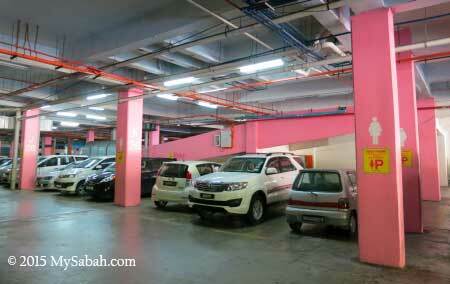 I learnt from a news that DBKK has 6,951 green, 3,081 yellow and 282 red parking lots. Out of curiosity, I did a simple calculation and estimate DBKK can make RM1.8 million of revenue from parking monthly, WOW! However, don’t take this as an official figure ok, they may not make that much because many people disregard parking fee. Some of my friends never pay a cent for many years and nothing bad happens to them (that’s a saving of a few thousands!). 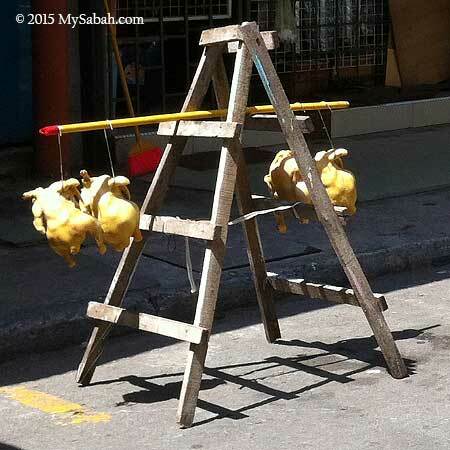 In the past, DBKK tried different fruitless measures such as wheel-clamp and blocking the road tax renewal. In short, they can’t do much about it (please correct me if I’m wrong). The only problem I see is – you may have problem to sell your old car if the potential buyer doesn’t want to take over your mess (parking debt and penalty). FYI, you can check your “debt” online with DBKK at ecompound.dbkk.sabah.gov.my. It’s your call whether you want to challenge DBKK. For me, I just pay for peace of mind. Have you paid your long overdue summon? Or Uncle Police will knock your door and invite you for a cup of bitter coffee. In the past, they always offered amnesty period with deep discount to those motorists who refused to pay the fine, making good citizens who paid on time looked so stupid. This time, instead of giving discount, they will give stubborn people a handcuff. 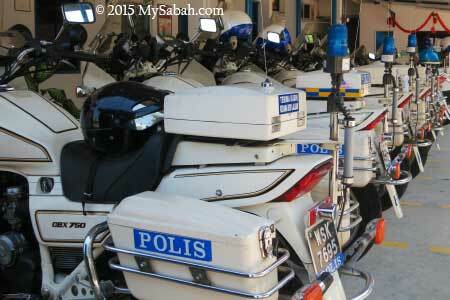 FYI, you can check your PDRM (police) and JPJ summon online at MyEG. It took me only 2 minutes to register and login to check, it’s free and worked perfectly.